I first met Peter J. Gomes in the autumn of 2000 when, as I began my freshman year at Harvard College, a work of mine was premiered at The Memorial Church on “Freshman Sunday.” When I later learned Peter’s own musical preferences, I realized that he probably didn’t much enjoy the youthful and somewhat thorny set of variations I had written for university organist Murray Somerville, but nevertheless, Peter’s encouragement of my work as a composer began that very day and only grew in enthusiasm and momentum until his death in February 2011. Peter’s musical taste was decidedly conservative. He had no time whatsoever for musical styles that were neither tonal nor melodic. His musical loves ranged from Bach to the composers of the English Victorian and Edwardian eras, but rarely went much further. 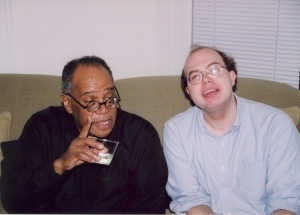 During my studies at Harvard, Peter would often tease me, asking if my teachers had tried to get me to “stop writing melodies.” His unflinching encouragement was crucially important to me during a period in which I was finding my way into a compositional life split equally between the concert and church worlds. In the years that followed, Peter commissioned several compositions from me to mark various occasions. I also set several of his prayers and writings to music and wrote him an organ solo inspired by one of his sermons. The latter particularly delighted him, as he told me it was the first unsolicited musical work that had ever been dedicated to him. Peter Gomes was known to most as a superb preacher, a prominent Christian leader, a best-selling author, a devoted teacher and scholar, and the long-time minister of The Memorial Church at Harvard. Though his lifelong love of music was well-known, few knew much about his own compositional proclivities. The son of a conservatory-trained musician, Peter was an organist himself and possessed effortless facility at the keyboard, able to play nearly anything by ear (in any key). He knew the repertoire of hymns backwards and forwards, with an unusually deep knowledge of both American gospel songs and obscure English hymns from the 19th and early 20th centuries. Peter had been composing hymns for years, but he notated only the melody, finding that the tedious method of manuscript notation was not conducive to his very intuitive creative process. However, with the acquisition in 2001 of a copy of the Sibelius music notation software and a digital keyboard, Peter went on a “hymn binge,” notating many of his past hymns and composing a number of new ones. Despite not using a computer for any other part of his life, he so enjoyed this process that he even wrote a few more ambitious works, including a congregational mass setting, several sacred art songs, and the music to a children’s Christmas pageant. Peter’s style reflected his musical taste and was a cross between English Victoriana and New England gospel—key signatures filled with flats, soaring melodic leaps, and plentiful dotted rhythms. He could (and did) improvise within his idiom for extended periods. My own work with Peter’s compositions began in the fall of 2002 when I received a telephone call from his assistant, Jan Randolph, saying “Professor Gomes has written a hymn tune, and he wants you to edit it before it’s used next week in church.” The tune was a setting of the text “O Lord of Life, Whose Power Sustains” by John Russell Darbyshire. The text commemorates the war dead, and Peter chose it for use at the yearly Armistice Day service at The Memorial Church (itself a World War I memorial). I picked up the manuscript from Jan, went through it to make sure all was in order in terms of the part writing and notation, and then met with Peter to discuss it. As I played the edited version for him, he listened with his eyes closed, opening them sharply when he heard something he questioned. By the end of our meeting, the hymn was finalized. Over the next five years, Peter called upon me frequently in a similar manner, and we always had a great deal of fun working on his pieces. He was unfailingly modest about his compositional efforts, but always possessed the confident conviction of somebody who knew full well what he liked. By 2005, the computer on which he ran Sibelius no longer functioned, and the composing bug seemed to have passed. In his remaining years, he still much enjoyed hearing his hymns sung and was especially pleased by a 2007 string quartet performance, led by Yo-Yo Ma and Lynn Chang, which included an instrumental arrangement of an art song from 2001. Three of his hymns were included in the 2007 fourth edition of The Harvard University Hymn Book, a project for which he served as chairman of the editorial committee. As anyone who knew him can attest, there was nothing about Peter Gomes that “conformed to the present age.” Yet he was precisely the sort of person so desperately needed in these times, and I am profoundly grateful to have known him. I will cherish forever the ten years of memories, and his encouragement will always ring in my ears as I continue on that lifelong quest for what is good and well-pleasing. Carson Cooman has served as Research Associate in Music and Composer in Residence to The Memorial Church at Harvard University since 2006.